Burger lovers and green veggie lovers, rejoice! In a rare display of connubiality, these two epicurean entities have joined together to create one deliciously verdant turkey burger. Be gone, obligatory thin, sad slices of iceberg lettuce and tomato; measly dollop of sautéed mushrooms and onion passing implausibly as an appropriate serving of vegetables. Finally, a recipe to show that vegetables have the ability to enhance, not hinder, a traditional carnivorous burger. They've got the right idea across the pond. 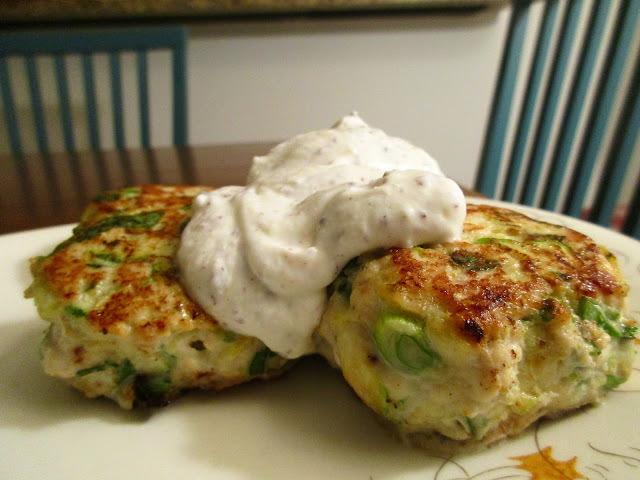 In Ottolenghi's Turkey & Zucchini Burgers with Spring Onion & Cumin, ample shredded zucchini, scallions, herbs, and spices breathe seasonally-appropriate vitality into the petite patties, little in size but certainly not in flavor. Slather in ketchup, you will not: these viridescent burgers are accompanied by a rich, zesty yogurt-sumac dipping sauce, offering crisp acidity with the burger's flora. Another piece of brilliance by the Brits? They refer to zucchinis as courgettes. Now, how much nobler does that make this burger sound? I appreciated the recipe’s effort to keep the burger light; scant oil, absence of bread crumbs, and low-fat sour cream and yogurt all contribute to the dish feeling rich in flavor, only. (For those of you keeping Passover, this is a great recipe to make post-seder and keep for the week!) If you like tartness, I absolutely encourage you to invest in Sumac—it’s worth adding to your rotation of cooking spices—but the recipe definitely still works if you don’t happen to have it. 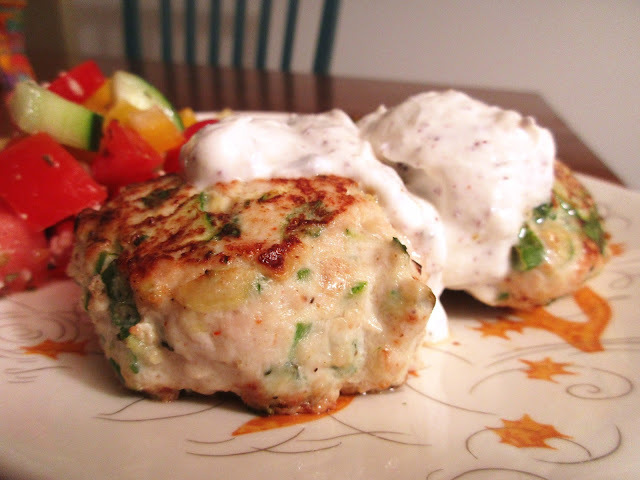 Just make sure not to skimp on the added herbs and spices; these really give pop to the otherwise mild poultry meat. Ottolenghi refers to the patties as “burgers”, but in reality, his suggested size is more like a meatball. 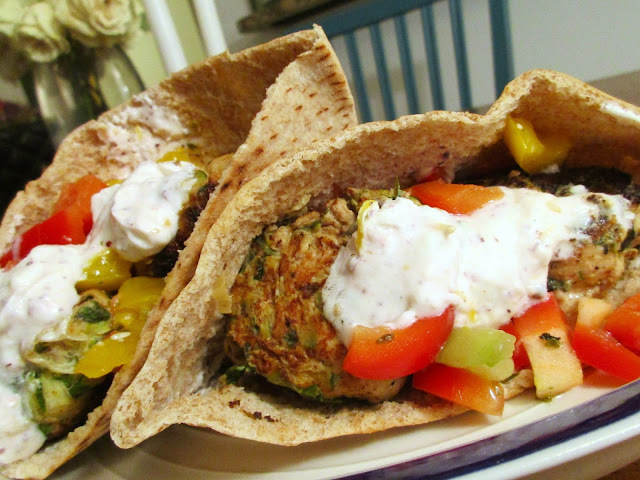 The smaller surface area worked in my favor, because the cook time is minimal, and I was able to easily stuff 2 meatballs per pita-half, the insides of which I smeared with the yogurt sauce and then topped with Greek salad, like a falafel. While pairing with a carbohydrate like bread or bun is not essential, it certainly creates a hearty lunch or dinner—couscous or whole-grain rice are good alternatives, too. On the other end of the spectrum, halving the size of the meatballs (and adjusting cook time to match) makes then perfectly bite-sized for a crowd-pleasing appetizer. Stick each meatball with toothpick, and serve the dipping sauce in a bowl on the side. They won’t crumble or fall apart—in Jerusalem, Ottolenghi highlights the patties' portability. So there you have it! A burger as green, vivacious, and exciting as Spring. 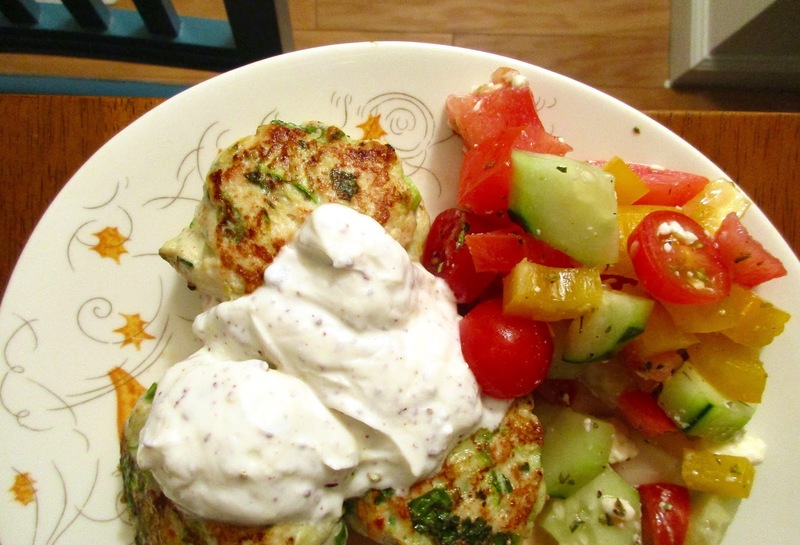 Burger, meatball, or courgette-speckled spheroid; whatever you call it, prepare to be wholly satisfied with each bite. 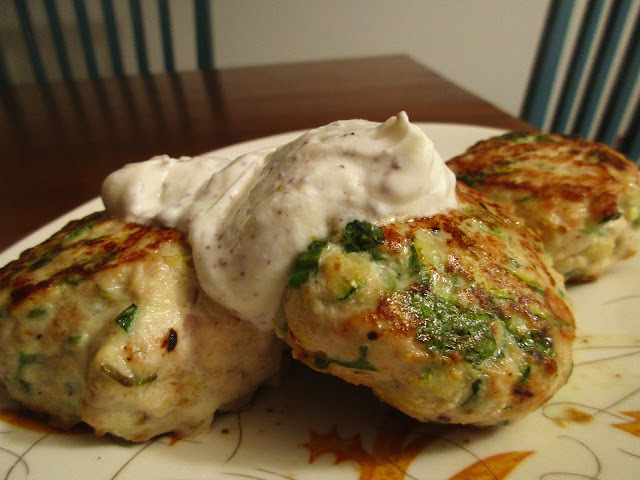 *Option to omit sour cream completely and use ½ cup extra Greek yogurt instead. Make the yogurt-sumac sauce. 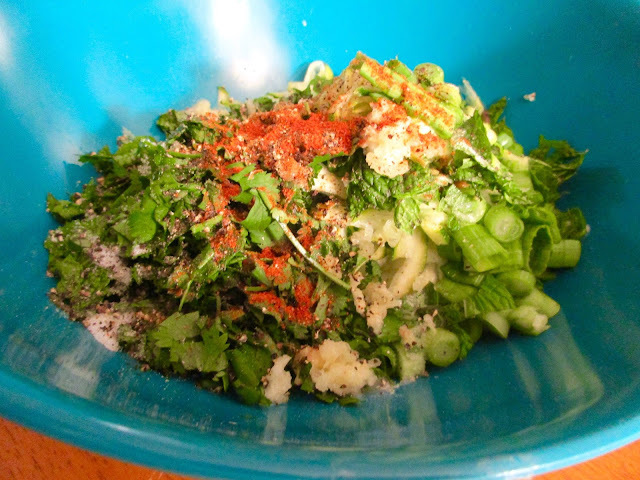 Place all ingredients in a small bowl, stir well, and set aside or chill until needed. Preheat the oven to 425 degrees F. In a large bowl, combine all the ingredients for the meatballs except the oil. 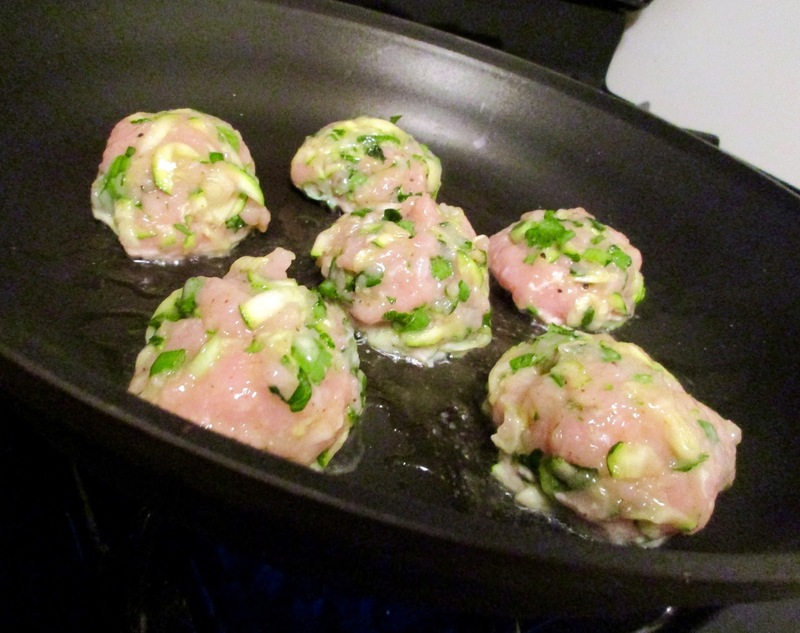 Mix with your hands and then shape into burgers, each weighing about 1½ oz. Pour 1-2 Tbsp oil into a large frying pan. Heat over medium heat until hot, then sear the meatballs in batches on all sides. Cook each batch for about 4 minutes, adding oil as needed, until golden brown. Carefully transfer seared meatballs to a baking sheet lined with non-stick foil. Place in the oven for 5 to 7 minutes, or until just cooked through. Serve warm or at room temperature, with the sauce spooned over or on the side.